The sheer volume of corporate and hospitality events held in London throughout the year means that the Event Hire London team are constantly working closely with their clients to ensure that we are delivering what the market needs. 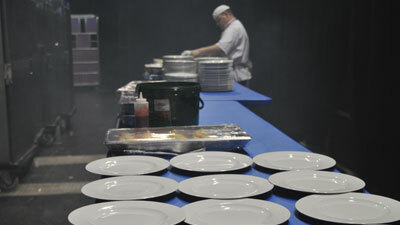 One of the key elements of the Event Hire London offering is that of catering equipment. Think of large catering ovens, hot cupboards, fridges, freezers, handwash units and so on, and you have the core of London catering hire equipment that is constantly out on hire, being as most hospitality events require some form of catering and, therefore, require temporary kitchen catering equipment. Perhaps the most important factor with catering equipment hire London is that we have the quantities required, and all our products are regularly PAT or LPG tested to ensure that our clients receive the very best catering equipment for their money. Supplying a seamless service such as this means that London caterers and event planners regularly return to Event Hire London to service their event requirements. And, as well as offering London catering equipment hire, the team also have substantial quantities of event crockery hire, cutlery hire and glass hire to cater for the majority of events, whether it be small parties or large event banqueting with hundreds and even thousands of covers. From canape tasting bowls through to pint glasses and even mulled wine glasses for Christmas, Event Hire UK has it all. Contact one of our sales team today and find out for yourself why our one-stop-shop for event hire equipment is popular across the country.